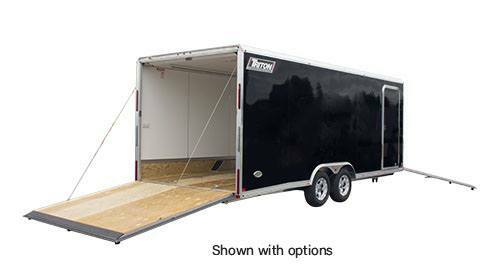 Lowboy trailers are ideal for hauling cars, motor sport and power sport vehicles, and equipment. Lowboy trailers are often customized with fully detailed interiors, audio and climate controls, and electrical supplies for specific uses and destinations. The Lowboy Series has Triton’s construction, fit and finish and offers the following standard features. Beavertail Design: Dropped rear beavertail deck for easy loading, especially low ground clearance vehicles. Double-Seal Ramp Doors: Spring-assist ramp door with double seal prevents leaks, keeping cargo dry. Built-in transition makes loading and unloading easy. Flexible Cargo Security: Four fixed, flush mount heavy-duty D-ring tie downs are bolted to welded brackets. Two full-length Quickslides have four flush tie downs to provide infinite tie down options. Spacious 98” interior between walls and 82” between 9” high wheel wells. High Carrying Capacity: Fixture-built frame with custom extrusions has 16” on center wall studs and 16” (12" on HD) on center floor crossmembers. Torsion Axles: Four cord rubber torsion axles with electric brakes on front and rear axle. Smooth Aluminum Skin: Bonded (screwless) .030” aluminum panel exterior. 28’ length models feature .050” aluminum panel exterior. Stainless steel ramp door latch with built-in keyed lock. Aluminum frame rollers on rear axle mounts. Front - 71 in. up to 83 in. Rear - 77 in. up to 89 in.